Someone emailed me to say they saw me in there but I can't figure out how some people have copies while I haven't seen this yet. Congrats on all your famousness!! Good luck getting back to the classroom... I know it's hard! So glad you had a lovely break, and congrats on your feature! can't wait to read more.. Congrats!! 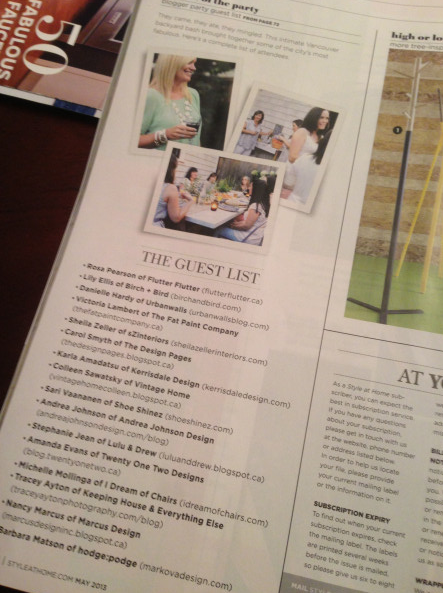 That is awesome - I am looking forward to seeing all you gals in the Style at Home issue. Good luck getting back into the swing of things tomorrow! Bravo! Congrats on the feature. Glad you had a good break and you and your spray paint are ready to go! Congrats Barbara, it is so well deserved! Can't wait to see the magazine! i will look for you in that issue! how fun! You rock at this now! Can't wait to see future features. You deserve it! I was just looking through my new Style at Home mag and saw your gorgeous face at the end of the table. Looks like a beautiful party and a lot of fun! 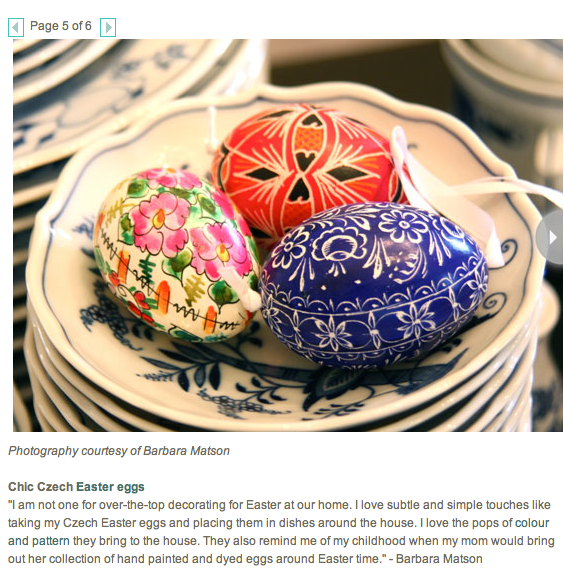 Your Easter eggs are wonderful and I love that they - and you - had a wee feature in Style at Home! You're fast becoming a go-to person for great info, projects and photos!! So fun about Tracey's cover too, hey?! I don't believe my photo will show up in the spread, which I'm glad about, but I'm very happy to see me/TFPC listed as a guest!!! March is known as Easter and every one seem to be happy and want to celebrate Easter with friends, family specially with children. I also purchased some furniture from online furniture store for my new house. And We will celebrate Easter at our new house. Your egg's designs idea is very cool. Happy Easter! I thought I recognized you in the article! Congrats. Looks like it was so much fun!